Paperback, 7 x 10 in. / 500 pgs / 100 bw. 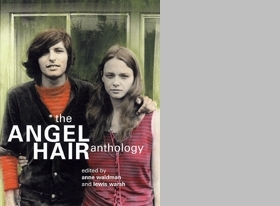 This anthology presents material selected from the collection of Angel Hair magazine and books edited by Anne Waldman and Lewis Warsh between 1966 and 1978. Included are substantial sections of writing--in some cases entire books--from an impressive range of poets including Clark Coolidge, Alice Notley, Hannah Weiner, Robert Creeley, Bernadette Mayer, Kenward Elmslie, Tom Clark, Joanne Kyger, Bill Berkson, Ted Greenwald, Lorenzo Thomas, John Wieners, Joe Brainard, Ron Padgett, as well as Waldman and Warsh, among many others. 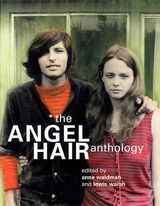 From the nascent St. Mark's Poetry Project on the Lower East Side of Manhattan to Bolinas and Boulder, Angel Hair published an idiosyncratic cross-section of innovative writing in distinctive format, becoming one of the longest-lived and most influential publishers on the small press scene. The anthology of literary writings is supplemented with brief memoirs by more than twenty writers, and the book also includes an annotated checklist by Aaron Fischer and Steven Clay that comprises a citation and photograph of each of the approximately eighty books, magazines, broadsides and catalogues issued by the Press. FORMAT: Paperback, 7 x 10 in. / 500 pgs / 100 b&w.